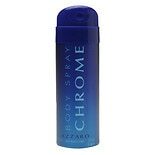 Shop Chrome Men's Body Spray Can (5.1 oz. )5.1 oz. $1699$16 and 99 cents$3.33 / oz.